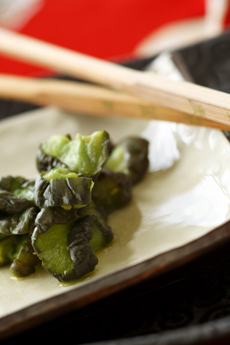 Japanese seasoned pickled cucumber, a type of tsukemomo. Photo by Katherine Pollak | THE NIBBLE. This is Page 5 of a 5-page glossary of all pickle types. Some of the terms below include relish, sauerkraut and sweet pickle. After you’ve peeked at the pickles, take a look at our other food glossaries—an easy way to get up to speed on more than fifty different food categories. Refrigerated is the most common home-pickling process, utilizing refrigeration plus vinegar to kill bacteria (i.e., acidification). This process yields the shortest shelf life, but bright green pickles that are crisp and crunchy. Relish, made from finely cut or chopped pickles, is available in many different flavors. There is sweet pickle relish alone and mixed with mustard, chow chow (a relish of pickled vegetables that can include asparagus, beans, cabbage, carrots, cauliflower and peas), corn relish (which can be mixed with bits of pickle), hamburger relish (which is not made with pickles, but red bell peppers, onion, vinegar and seasonings), India relish (tomatoes, onions, red peppers) and piccalilli (an Indian relish made of tomatoes, onions, cabbage, and red and green peppers). All can be used on burgers and hot dogs, to top deviled eggs, on sandwiches, in dips, etc. These are crouton-size cubes, made from sweet or dill pickles, specifically to be added to salads. Some salads they partner well with include green, arranged ones such as Cobb or chef, and potato. They are a convenience food for those who don’t want to take the time to chop their own cubes from whole pickles. The German word for “sour cabbage,” sauerkraut is is finely sliced, fermented (pickled) cabbage. Its popularity as a hot dog topping in the U.S. descends from its roots as a side dish for pork and sausage dishes—not just in Germany but throughout Middle and Northern Europe. Choucroute garni, a traditional dish of Alsace, is a plate of sauerkraut (called choucroute in French), garnished with sausages and other pork meats. Fresh cucumbers are first placed into a seasoned brine which doesn't include vinegar. The containers are then refrigerated, and remain refrigerated when stored and shipped. The longer the cucumbers remain in the brine, the more sour they become. Half-sour pickles are extra crispy and keep their fresh cucumber color. A pickle brined in a sweet mixture of vinegar, sugar and spices. Bread and butter pickles, candied pickles and sweet gherkins are some examples. 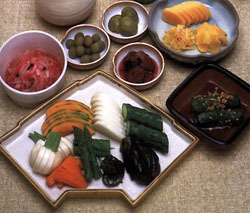 Literally, “pickled things,” tsukemono (soo-keh-MOE-no) is an assortment of vegetables pickled in a soy or salt brine, but can also include foods pickled in miso, rice bran, saké etc. Cabbage, carrots, cucumbers, daikon, plums, radish and turnips are among the fruits and vegetables pickled. The earliest pickles, misozuke (miso pickles), were made by embedding the vegetables in miso paste. Both oshinko and tsukemono are general terms for pickles. See also oshinko. Photo from the book Tsukemono: Japanese Pickling Recipes, by Ikuko Hisamatsu. Make your own at home! Some terms in this glossary were provided by Pickle Packers International, Inc., a trade association for the pickled vegetable industry. Visit ILovePickles.com.